I tried this rubber on the TB Spirit blade. It has enough spin for pushes and has good speed also. MXP is too fast for me. The ball goes long most of the time, even when I closed the angle of my blade. I have this rubber for about one month. I have a spinning game. I do not know how durable for this rubber. This rubber will last longer if use by a hitter. Yasaka 7 appears to last longer for a spinning game. Everything is above average. Decent speed, spin and feeling. Feels like upgraded Mark V. Good for Backhand. This is not only the best rubber for the money, but it's the best rubber to play slow spin loops. The dwell time and high through on this is ridiculous! That doesn't mean it's slow though for a long dwelling rubber. It is also fast for my game. It's the perfect speed and after playing with it for 2 years, I tried to play a Tenergy 05 sheet again just out of curiosity and I actually like the EL-P much more. This rubber can play all the shots and play them well, but it excels at high spin with a nice safe arc! Easy playing rubber. Nothing extremely special, but does everything well. Bad: quite heavy for such an all-round rubber. Shrinks if removed and re-glued many times. The Evo EL-P is one of those rubbers that you just can't go wrong with it. The rubber is not the fastest or the softest or the spiniest. But it is always reliable and all round type rubber that you can play many strokes. It bites the ball enough to lift backspin fairly well. But you have to hit the ball more on the side than perpendicular to the spin to get a better lift. It generates good spin on serves that your opponent has to respect it. But not like those Chinese rubbers where the ball goes crazy on spins. For top spin play, the rubber just works. It can loop and drive and smash with ease. Similar to the backspin shot, if you hit the ball on the side instead of perpendicular, it is a lot easier to loop with this rubber. Unlike the Chinese rubbers where you can hit the ball head on. The EL-P requires a slight change of contact point to maximize the rubber. The rubber comes tuned. The tuning effect lasts about 2 months or so. You can put some baby oil on it and refresh the rubber again. The rubber do shrink. So when you cut the rubber, do not stretch it or you may not be able to fit it back to the paddle the next time you re-glue it. I usually just use baby oil to get the rubber size back to before. I am by no means trying to tune it for the tuning effect. So I just put one layer of baby oil to let the rubber expand back to the original size and put it back to my paddle and play for a couple months again. Anyway, you can't go wrong with this rubber. This is especially true for anyone who is developing or intermediate level player. For the most advanced player, this rubber may be a bit slower and less spiny than say MX-P.
On the other hand, this rubber does not react too much to incoming spin. So it is safe for developing and intermediate players. I was using MX-P for two years and have been using EL-P for about four weeks. This rubber has a softer sponge and is more forgiving than MX-P. It is also a little bit slower than MX-P. I feel I have more control but still can generate a lot of spin. I think it is helping my game. The spin is great on this rubber. Although a little less on the speed the amount of spin produced is higher than MX-P. The only issue is the higher throw which I believe depends on each and every playing style. 28/06/2017 Very good rubber Review by Test and tuner. I tried this rubber as a replacement for tenergy 05. Firstly its nothing like 05 with respect to the throw angle produced as well as the amount of spin. However. Tenergy 64 on the other hand these rubbers are very similar in speed and trajectory. Similar in spin also. Its very versatile. Easy to block with and very fast paired with the right blade. Very good control for its speed and nice low arc to the . Awesome.bh and fh. Buena goma, lo unico malo de las serie tibhar es la duracion de 2 a 3 meses como maximo, las otras gomas siemre me duraban mas. Very average. Speed control and spin are okay but nothing special. Good point is it is light and suits for back hand for blocking. I'm using EL-P max on my backhand for control, block, openups and close-mid distances backhand spins on my Clipper CR WRB. I'm very happy that with the help of the elasticity, i can load lots of spin from my backhand for service returns. Also, in the table, you can open up close to the net serves easily. You can change the speed of the game with the help of rubber from your backhand since it has high control. EL-P is good for my forehand. Before, I used Donic S1, now EL-P is the replacement fit-in for my play. If you are offensive player you can buy this rubber. Very solid offensive rubber. A little bit softer than I thought it would be. Good speed. Would like it to be a little more grippy. 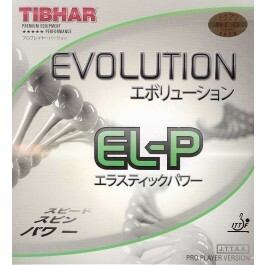 The Tibhar Evolution EL-P is quite the attacking rubber. It is excellent for mid-distance range exchanges with fantastic top-spin. The contact time with the ball lasts longer than tacky rubbers or the Tenergy 05 giving more sensation of the amount of spin delivered; better for adjustment of game quality. The grip of the rubber is comparable to the Tenergy 05 and with slight wear is better than it; its wear is excellent it will last well. The attack angle is not as small as the Tenergy 05 making it more troublesome for the short-range game; hits the net more easily on starting the top-spin rally but the speed of the rubber is definitely better than that of the Butterfly Tenergy 05 which costs at least 1.5 times the price; it is most appropriate for the forehand, but will be great for a player playing back-hand not too close to the net.. This rubber is used by Samsonov the famous top 10 player (noted for his famous defensive play). This rubber works fine for backhand, good control and remarkable for offensive backhand plays. This rubber is quite soft which is why it is suitable for backhand. 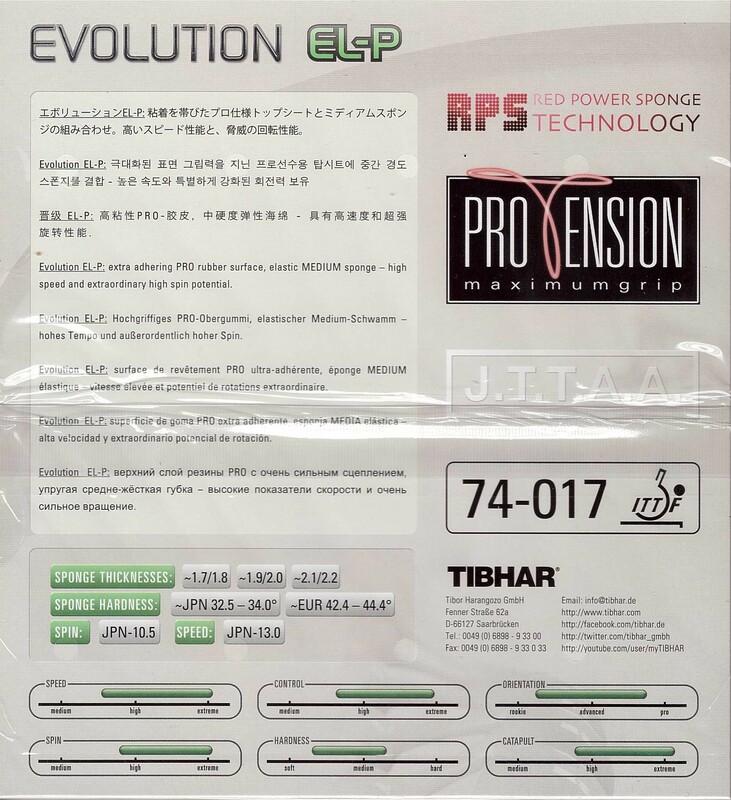 We did not have to buy rubbers TIBHAR , until we have esta excellent alternative , we are happy , my son played with an ever esta brand and not exchanged for another None. A used 1T and Evolution FX - P , EL- P and P - MX . I have it on Nittaku's Barwell on BH. (1.7mm) It's a great combination. It's fast but to too much, and the quality of spin and controll are just amazing. Put it on Nittaku BASALTEC OUTER backhand, very good on speed / control / spin. Compare to my previous T64, a little bit slow but very balanced rubber. Since Nimbus Soft, there have been many new models, including the Sinus and Genius ranges, and now the Evolution range has been superseded. The first thing I noticed with this Evolution was that it has a bigger range of speeds - more gears - than nimbus soft. The ball doesn't hop high off my blade (blade about OFF- in speed), but the oomph is there for FH loops if you put your body into it. I found the sponge a bit mushy. As indicated on packet, the rubber is a bit soft. This gives great feel but less oomph. But the softness gives better control, so it come down to what firmness you prefer. 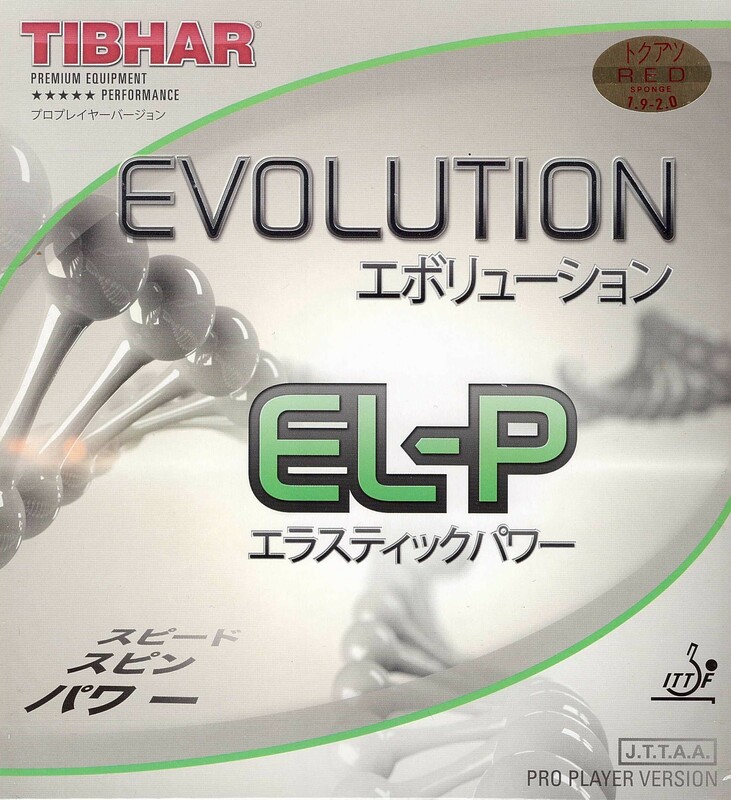 I think there is a softer version of Evolution (about 4 types in all), but I wouldn't choose it. If you're BH isn't strong and you need good feel, then the Nimbus Soft or this rubber would be fine, as they both give a big margin for error. Or even the softer Evolution could be ok. I don't know how long this rubber lasts, but the Nimbus Soft sheets I've bought in the past have lasted years... I haven't worn any of them out. Nimbus Soft doesn't have all the gears, but it's the training you do that counts, plus I've known it to last. Next time I might save myself 7 Euro and just buy the Nimbus Soft. Nimbus Soft is very mushy: you can feel the ball penetrate into the rubber for ages. Some people like this effect and some don't... Some momentum is lost in shots, which is why the Nimbus Soft isn't as fast as harder sponged rubbers. Same goes for the Evolution. Overall, I think Evolution is only an evolved Nimbus, rather than revolutionary. It is a very good backhand rubber. good for back hand or all round player. Хорошая накладка. Мне понравилась именно 2.0 мм . Хорошо играет на жестких основаниях. For me personally, this is a very fine product.The perfect bh rubber to pair with Chinese rubbers or Tenergy 05 on the fh. Medium, semi-soft sponge, but does not bottom out. Great control. Good spin and power. Very forgiving and linear. 90% power compared to other, bouncy rubbers in its generation, but has more gears, and is more predictable. Not really a Tenergy replacement. But it has a dynamic feeling right out of the package. Worth a try, for sure. This is definitely a rubber to consider if you don't want to pay for Tenergy on both sides! I can't find this rubber on Brazil. Very good price and shipment. My first combo and it fits with XIOM Hayabusa ZXI. Great spins and control. 버터플라이 비스카리아에 포핸드 MX-P, 백핸드에 EL-P를 사용하고 있습니다. 고성능의 러버치고는 융통성도 굉장히 좋아 라켓에 공이 닿기만 하면 리턴되는 것 같은 마법을 부립니다. 저에게 더 이상의 조합은 없습니다. I used this rubber for couple sessions and don't need to adjust much from I used to play with Tenergy 64 for my bh. I tried to loop with my forehand but it has less tension compare to what I used Tenergy 05. The top sheep is more grip or a little tacky than tenergy series. The spin is very good and very easy for blocking. The top sheet looks like never use after 4 or 5 hours of playing time. However, I don't know how long the rubber will last yet the price is more reasonable compare to ternergy.